Destinations for All will feature over 130 speakers from around the world including world leaders and ambassadors in accessible tourism. 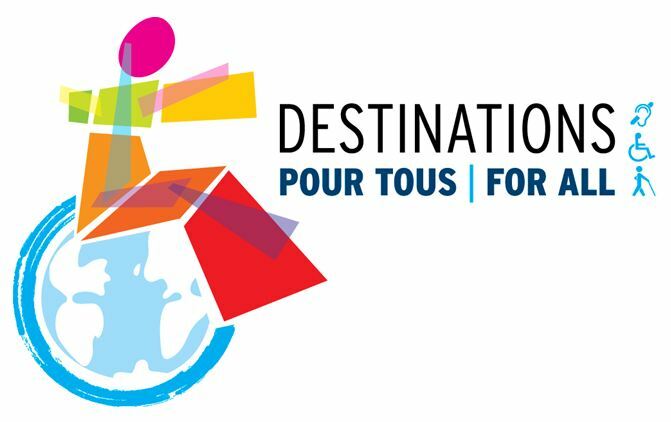 This first-ever World Summit dedicated to Inclusive Tourism in destinations has just now published presentation abstracts. Read through Then meet us there in Montreal. It is my pleasure to invite you to participate in 5th International Conference on Accessible Tourism (ICAT 2014) with the theme TOURISM FOR ALL that to be held from 4 till 7 December 2014, at MBPJ Civic Hall, Petaling Jaya, Malaysia. ICAT 2014 is an event that aims to bring the Elderly and People with Disabilities to the heart of a more inclusive global society, in the same time to create awareness on this potential and niche market. It is the first of such world-wide international events organized in Malaysia and will positively lead to an increased recognition and encouragement of policies and actions to promote Accessible Tourism for all. The purpose of this conference is to present a discussion forum to identify key policies, strategies, and to provide information to policy makers, industry players, consumers and the public on Accessible Tourism for all. At the meeting, international guest speakers will be invited to discuss on the implementations, as well as to share country reports and progress on the topic. Pre-Conference Tour and Access Tour will be part of Conference program for participants to experience the exciting of touring in Malaysia and giving input for improvement. The tour will take the participants to explore the fascinating sights in and around the city. Enjoy visits to cultural & heritage places and cosmopolitan structures that will leave them enriched with an experience of Accessible Tour. During the course of the event, there will also be an on-going exhibition featuring the accessible tourist attractions in Asia Pacific Region, interesting packages and facilities on Accessible Tourism. One could easily plan for an exciting and accessible tour with all the information provided. Besides that, the exhibition of arts and craft and various traditional hand-made products created by PWDs would highlight the contribution of PWDs in the field of tourism industry. In the same time there will be International Disability Arts Festival, Singing and Dancing Contest for those who have talent in performance to take part. Another important purpose of ICAT 2014 is to officially form the Asia Pacific Network On Accessible Tourism (APNAT), in order to build up a bigger and wider network to create greater impact of Accessible Tourism to the world. Below please find the Conference Fee, Hotel Room prices and details for Optional Tours. A draft program is attached for your reference. Further information is available on http://icat2014.beautifulgate.org.my. For all other enquiries, please contact icat2014@beautifulgate.org.my. (a) KL City Tour, sightseeing and the experience of hardknock (making own pewter bowl) with lunch. (b) Selangor Nature Park & Fireflies Night View Tour with dinner. (c) World Heritage Malacca daytrip tour with lunch. I am also attached here the tentative program and registration form for your perusal. We look upon of your participation as it will bring much support and contribution to the conference and to the disabled community. Thank you. Executive Director, Beautiful Gate Foundation For The Disabled. "The idea of 'Sport Doesn't Care' is that sport is the great leveler," says Carlo Cavallone, ecd at 72andSunny in Amsterdam, of his agency's hard-hitting 90-second spot for Paralympics sponsor Samsung. "Abled and other-abled athletes are exactly the same when it comes to competing," he tells AdFreak. "Paralympic athletes don't go to the games because they want to make a statement about their disability; they go because they want to win a medal. This is often missed in the communication about this event." O Comitê de Deficiência e Acessibilidade da Associa? ?o Brasileira de Antropologia convida para a apresenta? ?o de trabalhos e posters no GRUPO DE TRABALHO: ETNOGRAFIAS DA DEFICIêNCIA, na 29a Reuni?o Brasileira de Antropologia, em Natal, de 03 a 06 de agosto de 2014. A quest?o da deficiência sempre esteve presente na história da civiliza? ?o, mas foi somente nas últimas décadas que as pessoas com deficiência passaram a se narrarem e a se constituírem como sujeitos de direitos humanos. Isso permitiu o surgimento, nas Ciências Humanas e Sociais, dos Estudos sobre Deficiência, um campo de investiga? ?o cuja proposta central é apreender os diferentes sentidos e significados da categoria deficiência em suas rela? ?es históricas e sociais e a articula? ?o com outras categorias de análise, como o gênero, a classe, a ra?a/etnia, a sexualidade, dentre outras. Os debates que a envolvem incluem quest?es, diversas, transversais e interdisciplinares, tais como os desafios da formula? ?o, execu? ?o e avalia? ?o de políticas públicas para pessoas com deficiência, a inclus?o escolar, o acesso ao mercado de trabalho, o combate e enfrentamento ao capacitismo, o suporte de vida independente, o incentivo aos esportes paraolímpicos, a participa? ?o em espetáculos de dan?a, o usufruto dos direitos sexuais e reprodutivos, entre outros. Neste GT almejamos trabalhos que possam criar uma interlocu? ?o com temas diversos em torno da deficiência, a partir do uso do método etnográfico e à luz de uma perspectiva antropológica focada nos Estudos sobre Deficiência, permitindo um debate mais intenso acerca da diversidade teórica desse campo de estudos.